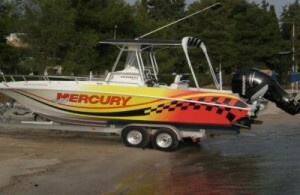 WE UNDERTAKE POLISHING AND WAXING OF YOUR BOAT. SERVICE WITH SPECIAL TREATMENT POLISHING LIQUID WHITCH POLISH AND PROTECT THE FIBERGLASS , COLORED AND VARNISHED SURFACES OVER THE WATER LINE. CONTAINS SILICON WHICH PROTECT THE SURFACE FOR MANY YEARS. FINALY WE WAXING THE SURFACE WHITCH HAS PTFE MAKES A HARDNESS FOR EXTRA LONG PROTECTION. WITH EVERY SERVICE WE CHECK THE ELECTRICAL FOR THE MARINE ENGINE AND BOAT.FOR THE BIGGER ELECTRICAL PROBLEMS WE COOPERATE WITH QUALIFIED ELECTRICIANS. WE UNDERTAKE THE REPAIR OF GEL COAT IN THE EVENT OF DAMAGE WITH EXPERIANCE AND EFFICIENCY. IF DESIRE ORIGINALITY ON YOUR BOAT OR YOU WANT TO ‘ADVERTISΕ ‘ YOUR BUSINESS ON THIS , WITH EXTRENAL PARTNER OFFERS YOU ANYTHING YOU ASK. 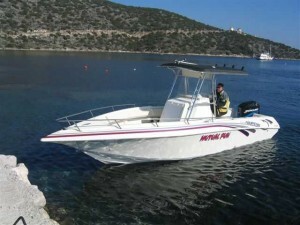 WITHH PRINTED VINYLS JUST TO RENEW THE STICKERS OF YOUR BOAT UP TO COVER THE ENTIRE BOAT WITH A DRAWING AND COLOURS YOU WANT.